The market has been pleasantly surprised after two weeks of companies reporting Q2'17 earnings. According to Zacks Investment Research, earnings and revenue growth are tracking below Q1'17 results but the number of companies that have beat their estimates so far is notably above historical levels. As a result, all major indices are trading near their all-time highs. A few notable constituents of the Dow Jones Industrial Average that most recently beat both earnings and revenue estimates include McDonald's Corporation (NYSE: MCD), Caterpillar Inc (NYSE: CAT) and E I Du Pont De Nemours And Co (NYSE: DD). All three stocks are trading near their all-time highs following their earnings announcement. All three companies also happen to operate in three completely separate sectors (consumer discretionary, industrials and materials). This may indicate a healthy economic environment which would bode well for companies that have yet to report their Q2'17 figures. 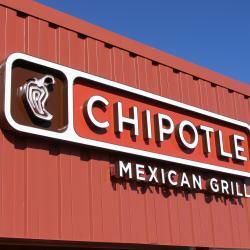 The following stocks could all trade significantly higher following an earnings beat next week. 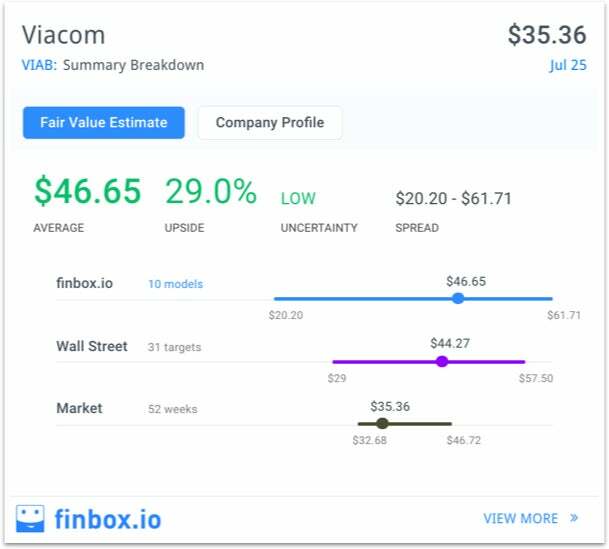 There are 1,048 companies expected to report earnings next week (7/31 - 8/4) where finbox.io calculates a fair value estimate and only a handful appear to be fundamentally undervalued. 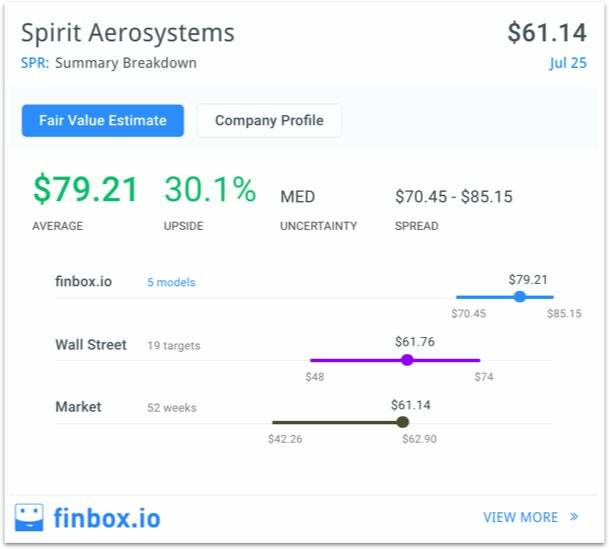 Our intrinsic value data from this stock screen highlights five companies with 20% or more upside: Spirit Aerosystems (NYSE: SPR), Viacom, Inc. (NASDAQ: VIAB), Ingredion Inc (NYSE: INGR), ARRIS International plc (NASDAQ: ARRS) and Archer Daniels Midland Company (NYSE: ADM). Spirit Aerosystems designs and manufactures commercial aero structures worldwide. 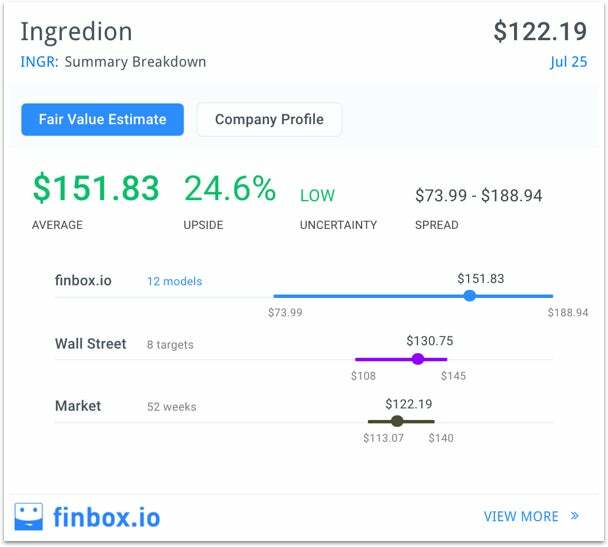 The company is expected to report earnings next Wednesday, August 2nd and currently has a finbox.io fair value of $79.21 that implies 30% upside. 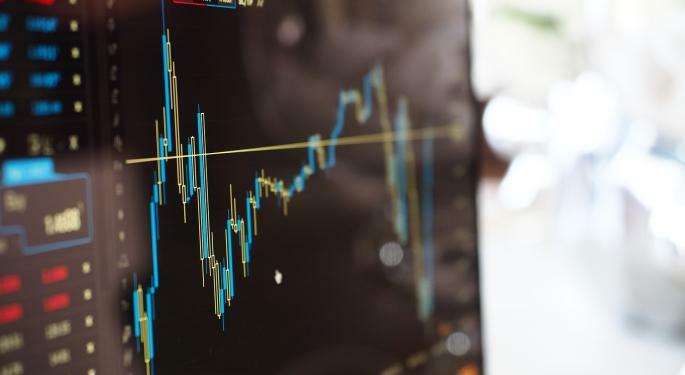 Although Spirit trades near its 52-week high, its valuation multiples generally trade at a discount to its peers: Rockwell Collins, Inc. (NYSE: COL), L-3 Communications Inc (NYSE: LLL) and Huntington Ingalls Industries Inc (NYSE: HII). The company's LTM EBITDA multiple of 8.6x is below COL (15.3x), LLL (13.2x) and HII (9.7x). Viacom operates as media brand worldwide and is expected to report its Q2'17 figures next Thursday, August 3rd. Ten separate valuation models calculate an average intrinsic value of $46.65 for the stock which implies 29% upside. This is slightly above the average Wall Street price target of $44.27. The company's return on equity of 27.6% over the last year nearly matches the stock's upside which was also well above CBS Corporation's (NYSE:CBS.A) 12.8%, Time Warner Inc's (NYSE: TWX) 16.8%, Walt Disney Co's (NYSE: DIS) 19.4% and Lions Gate Entertainment Corp. (NYSE:LGF.A) 0.9%. Ingredion is expected to report earnings on Tuesday, August 1st. Twelve valuation analyses conclude approximately 25% margin of safety. However, when excluding finbox.io's Earnings Power Value analysis (which is highly conservative in nature) we calculate a margin of safety closer to 30%. 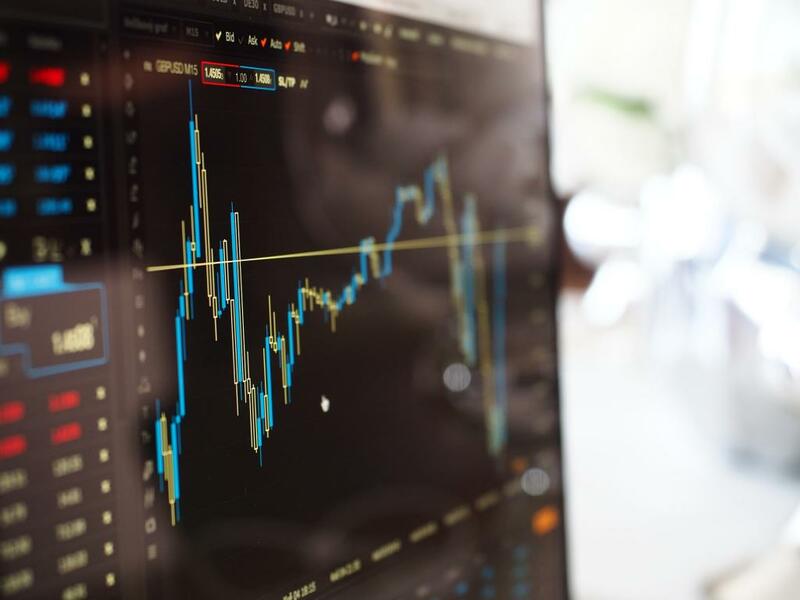 This is another stock whose EBITDA multiple trades at a discount to its comparable company universe: McCormick & Company, Incorporated (NYSE:MKC.V), J M Smucker Co (NYSE: SJM), Treehouse Foods Inc. (NYSE: THS) and Pinnacle Foods Inc (NYSE: PF). Ingredion's LTM EBITDA multiple of 10.3x trades well below MKC.V (17.0x), SJM (12.2x), THS (12.3x) and PF (16.1x). 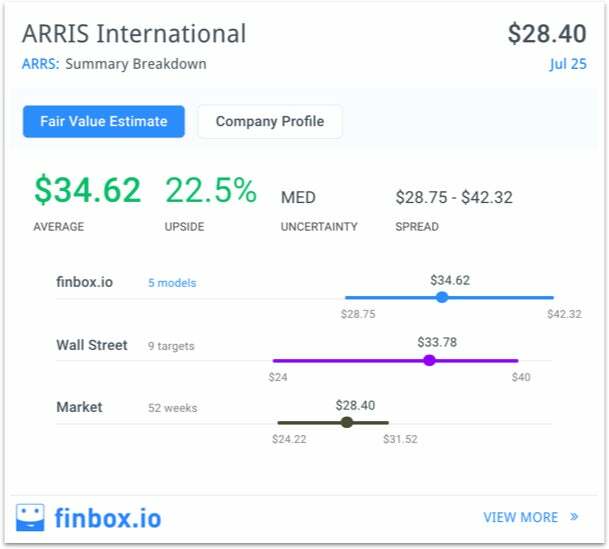 ARRIS International's stock has an intrinsic value of $34.62 implying over 20% upside before earnings (expected next Wednesday - 8/2). This compares favorably to the Wall Street's consensus price target of $33.78 which still implies 19% upside. 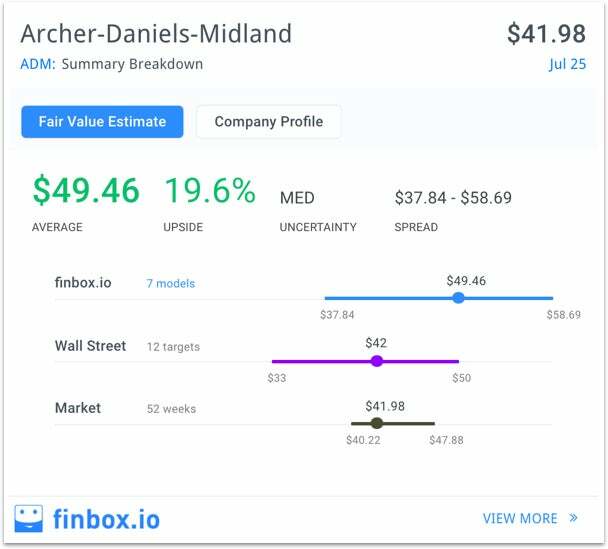 Archer-Daniels-Midland transports, stores and merchandises agricultural commodities and products and is expected to report Q2'17 figures Tuesday, August 1st. Shares trade only 4% above their 52-week low and seven cash flow analyses conclude the stock is approximately 20% undervalued. These stocks all have strong fundamentals and could easily trade +20% higher based on their underlying earnings. Value investors may want to take a closer look at these names prior to earnings next week. Note: this is not a buy or sell recommendation on any company mentioned.